Despite a number of flaws, we’ve fallen in love with this compact and sonically gorgeous recreation of a digital classic. Polyphonic sequencer and arp make great additions to the D-50 formula. Packed with classic presets, and with the ability to load more. This year has seen Roland expanding its Boutique range at a pace so rapid it can be a little hard to keep up. The latest addition, the D-05, is something a little different to the majority of the range, however. 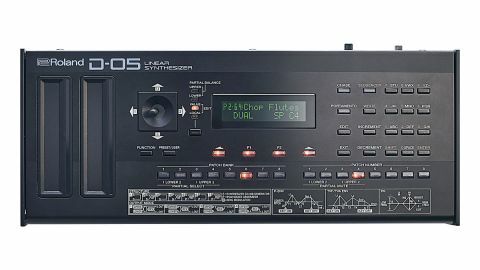 Whereas most of the Boutiques to date have used Roland’s ACB tech to emulate the electronics of vintage analogue instruments, the D-05 takes as its basis the D-50, an all-digital ‘Linear Arithmetic’ (LA) synth first released in 1987. The D-50 was Roland’s response to the popularity of the Yamaha DX7. It combined 8-bit PCM samples with its analogue-style LA synth engine to create complex, layered sounds built of multiple partials. This distinctive approach, combined with some excellent patch design led by Eric Persing, now of Spectrasonics, made the D-50 hugely popular. Whether or not you’re already aware of the instrument itself, its presets are sure to conjure up instant nostalgia for the late-’80s and early ’90s, thanks to their prolific use by the era’s biggest pop, club and soundtrack producers. This inescapable association with the era of its release instantly makes the D-05 more of a love-it or hate-it thing than many of the other Boutiques. Whereas the analogue sound engines of instruments like the SH-101, Jupiter-8 or Juno-106 are fairly timeless, the PCM sounds that shape much of the character of the D-05 keep it rooted in a distinct retro digital tonality. Personally, we’re firmly in the ‘love-it’ camp; there’s a unique, otherworldly complexity to the sound of those classic D-50 patches that works fantastically for bringing a touch of ambience or cinematic grandeur. Sonically the D-05 is largely indistinguishable from the original D-50. Despite the Boutique having to rely on slightly different chips and electronics to the original, the process of digitally recreating an already digital instrument is always going to be a more achievable task than attempting to emulate analogue circuitry. Inevitably, there’s debate to be had about the subtle differences in how each’s sound engine behaves, but realistically even seasoned D-50 users are going to struggle to tell the two apart in a blind test. In terms of the basic architecture of the synth, the D-05 is pretty much an exact replication of the D-50. As before, patches are split into upper and lower ‘tones’ each of which is comprised of up to two partials. Each partial can be either a PCM sample or a synthesized sound created by the LAS engine. The D-05 comes stocked with all the presets of the D-50, along with its four sought-after expansion cards. There’s a fresh bank of 64 new presets too. That’s six banks of 64 presets in total. Each preset bank also comes stocked with a selection of 32 reverb/delay types. What’s more, it’s possible to load in original D-50 patches - plenty of which can be found for download online. On top of that, there are eight banks of 64 empty user patch slots onboard, ready to be loaded with your own sounds. Finally, the sequencer has a total of 64 pattern slots too. The D-05 maintains the same overall 16-voice polyphony, which can be divided up in a number of ways, allowing patches to be a single 16-voice tone, a pair of 8-voice tones or a combination of monophonic and polyphonic tones. The two tones can also be set up to be controlled separately via keyboard splits or separate MIDI channels. Most of the features and the interface of the D-50 are replicated for the D-05. This includes the Chase function, which allows for the lower tone to be triggered slightly after the upper, and either looped or alternated with the upper tone to create an effect like a cross between a delay and a basic arpeggiator. The performance joystick of the D-50 - used for programming duties and morphing between tones - is present and correct too, albeit in a small and slightly flimsy-feeling form. The gorgeous digital effects are here too, offering multi-type reverb/delay plus EQ and a lovely retro-sounding chorus. The D-50 was far easier to program than the notoriously impenetrable DX7, but its button interface - replicated here - is still pretty fiddly to work with. The original D-50 could be programmed far more quickly via the slider-laden PG-1000 controller. We’d love to see Roland bring out a new version for the D-05, either in hardware or software form. There are fresh features added here too, most notably a 64-step polyphonic sequencer and multi-mode arpeggiator. Both of these are great additions; note input and editing is well implemented, and both offer a simple method for inspiring evolving melodic patterns that really suit the D-05’s complex sound engine. As with other Boutiques, a pair of touchstrips offer up pitch and expression control. An added USB port provides power and MIDI input too. There are some Boutique range features that are less welcome though. The outputs are limited to main and headphone mini jacks. These smaller, underpowered outputs are fine on affordable products like Volcas or Pocket Operators, but on a synth priced at over £300, the lack of ‘proper’ outputs feels cheap. It can output audio via USB, but doing so involves setting the D-05 as your audio interface, which isn’t always the most practical solution. Similarly, as it’s designed to be compatible with Roland’s K-25m keyboard dock, it ships without a proper case, so you’ll need to shell out extra if you want a case/stand. These are foibles we can overlook though. The D-05 offers a near perfect recreation of one of the most era-defining synths of the ’80s, now in compact, relatively affordable form. It’s hard not to fall for that.